High pressure, 700 bar, FS series flange spreader. HYDRAULIC flange spreaders from Enerpac are purpose-built to take manual labour out of the job with five and 10-ton hydraulic power capacities to swiftly and safely drive a wedge between the lips of the flange. The FS series flange spreaders help safeguard the integrity of pipelines and flanged machinery by incorporating a pin by the splitter's jaws which fits through the pipe flange and holds it in line while its flanges are being separated. 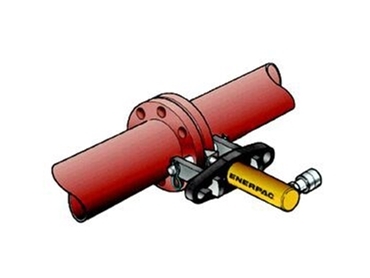 Enerpac's 700 bar high-pressure FS Series - with standard spread capacities from 70-216mm - is suitable for use within industries where flanged joints are commonly encountered during fabrication and maintenance tasks. For flanges that require larger spreading distances and have a larger joint, an optional larger wedge is available. Both the FS-56 and FS-109 spreaders are available individually or as sets incorporating tool gauge, couplers, hose and handpump. With the FS56 and FS 109 pump-spreader combinations weighing approx 15 and 22kg respectively, the spreaders can be easily transported and operated by one person.